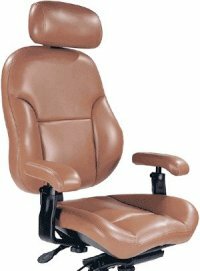 Bodybilt Chairs set the ergonomic standards for office chair manufacturing. That is why we rely on Bodybilt performance, comfort and durability; and have for 14 years. Heads of state, the U.S. government and the world’s wealthiest man all sit in Bodybilt Chairs. Once offering a variety of other manufacturers’ ergonomic chairs, we refined our office chair solutions to those that are most often doctor recommended — Bodybilt epitomizes that. Look No Further — Best Pricing, Best Service — Our prices are better than manufacturer direct pricing. Since all Bodybilt chairs are custom built to order, you will have to configure a chair to your specifications to view our better than 40 percent off manufacturer list pricing. BodyBilt ergonomic office chairs are for the productive work environment. More than 60% of all occupational illnesses are due to repetitive motion disorders, particularly those resulting from sitting intensive tasks (source: Department of Labor). The costs of claims are escalating and, for many workers, the damage leads to decreased productivity and a lifetime of suffering. Lower back pain, aggravated by inferior seated posture and poor weight support, is second only to the common cold as a reason for missed work. Back problems are now the leading cause of disability for workers under the age of 45. So, how does one increase productivity and reduce chances of work-related injuries or postural stress? Supporting the posture that the human body assumes in a zero-gravity environment. This is the most stress-free posture that a person can maintain. One of the ways the BodyBiltchair enables proper postural ergonomics in the workplace is to incorporate the 10-Point Posture Control Mechanism into all of their chair control mechanisms. This helps facilitate the natural stress-free posture that was discovered by NASA during their studies of astronauts in space as well as to adapt the chair position to the user and task at hand. Additionally, their unique seat contours are designed to help seated workers emulate low gravity, by distributing the users weight to the body structures best suited to support their weight. The result is significant reduction in seated pressures (psi) and muscle tension. Relaxation and lack of muscle activity has been shown by the use of EMG studies which measure the electrical activity in a muscle.